see Sarkanniemi Theme Park. The adventure continues: take in panoramic vistas at Pyynikki Park and Observation Tower, contemplate in the serene atmosphere at Tampere Cathedral, steep yourself in history at Amuri Museum of Workers' Housing, and make a trip to Nasinneula Tower. To find traveler tips, where to stay, reviews, and tourist information, read our Tampere trip itinerary planner. Stockholm, Sweden to Tampere is an approximately 4-hour combination of flight and train. You can also fly; or do a combination of ferry and car. Due to the time zone difference, you'll lose 1 hour traveling from Stockholm to Tampere. Plan for a bit cooler temperatures traveling from Stockholm in October, with highs in Tampere at 8°C and lows at 0°C. 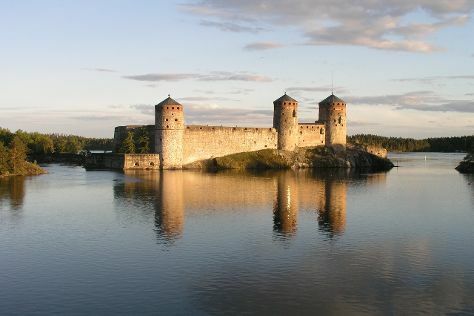 Wrap up your sightseeing on the 21st (Sun) early enough to drive to Savonlinna. Kick off your visit on the 22nd (Mon): step into the grandiose world of Savonlinna Cathedral, pause for some photo ops at Savonlinna Herostatue - The Hero's Grave, and then step into the grandiose world of Olavinlinna Castle. For reviews, where to stay, photos, and tourist information, refer to the Savonlinna trip planning app . You can drive from Tampere to Savonlinna in 5 hours. Alternatively, you can do a combination of train and flight; or do a combination of train and bus. In October, daily temperatures in Savonlinna can reach 7°C, while at night they dip to 1°C. Wrap up your sightseeing by early afternoon on the 22nd (Mon) to allow enough time to travel back home.